Cost: $40 for 2 people or $20 for a single. Event is for Adults 21 and over only. 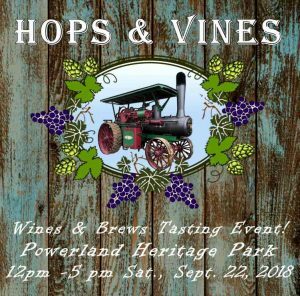 Come enjoy fall wine, beer and spirit tastings at Powerland Heritage Park’s newest event: Hops and Vines. The Oregon Electric Railway Museum is hosting BuddaKat Winery as part of the event. The date is Saturday, September 22, 2018 from Noon to 5 pm. Our museum, along with other Powerland museums, will be hosting some of finest wineries, breweries and distilleries of the Willamette Valley! Tickets are only $40 for two people or $20 for one person. You’ll enjoy tastes compliments of these Oregon wineries, breweries, and distilleries and have the opportunity to purchase spirits, fine wines and craft beers. You’ll experience the history, the early technology, and the amazing people who powered Oregon’s economy from the late 1800s through the mid-20th century. Plus Trolley Rides will be available for $5/person. Note, this event is restricted to adults 21 and over only please. There are a limited number of tickets via Powerland’s Website. Tickets will also be available on the day of the event.Hope to see you there!